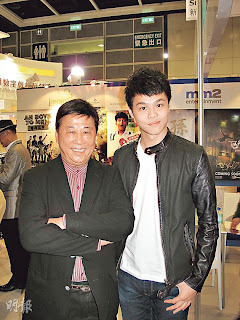 Ha Yu and his son Wong Chun Ming attended two films ATM (TAI FOON GEI) and BLACK MAGIC (TIN HA DAI YUT DUK GONG) press conference. Ha Yu is the producer. He said that ATM will start production in August. Will his son Dixon Wong Chun Ming star in both films? Ha Yu said that has not been decided yet. He himself started as chore boy, thus he wanted his son to start from the bottom too. Why would Ha Yu permit his son to join the business? Ha Yu said that they have an agreement of no smoking, drinking, drug, joining the mob and gambling for his son. Although his children were grown, Ha Yu never thought about retiring. Speaking of the recent family tragedies, he joked, "After reading about them I dare to retire even less. I am afraid that I would lose touch with society. If I don't work, what am I going to do when my son cuts off my head and puts it in the freezer?" He also jokingly said to his son, "I am sorry for any inconvenience, please forgive me." He even told his son who has not dated yet that it would be best for him to find a rich woman to take care of him.